We have breakfast with the yachtie set on the Rio Dulce. We say adios to Capt John and the Windy Dancer and also to Sean our Canadian companion. Although we aim to meet up in a week or so in Antigua. We get the next chicken bus towards Flores. We actually see a chicken on this bus, tucked snugly under its owners arm headed off to market. Mid way to Flores the bus breaks down. The driver seemingly used to such an occurrence and pops open the engine cover and begins work on a leaking water pump. Meanwhile two men with guns get on. They are not police. Despite the shock at seeing armed men board our bus. I was interested to learn the day before that carrying a gun in Guatemala is as common a wearing a watch. The gun normally displayed with the ammunition cartridge disengaged supposedly to give passers by they were not the intended target. Still it’s a little eye opener that Guatemala has a sinister side and a little bit more unstable than Mexico and Belize. Muggings, robberies and pickpocketing and the like on buses like this not an uncommon practice. It turns out these guys were just being neighbourly and checking if the bus driver needed a hand in repairing his overheated bus. How very nice of them! We get off the bus at Santa Elena and get a minivan to El Ramate. When I say we, at this point Martina and friend Juli are still with us and with a knowledge of Spanish Allison and I are being a bit lazy in our conversations with the locals. Also just catching a minibus sounds like it was waiting for us to disembark our previous bus. Couldn’t be further from the truth. Bus travel through Central America is purely a DIY activity. With every conductor trying to convince you they are the bus to get on or the next bus to leave, it takes some figuring out what is actually correct. You normally end up on the side of a dusty road unsure of what bus if any will pass by hoping that the guide book you have is still accurate in depicting the location of unmarked bus stops. 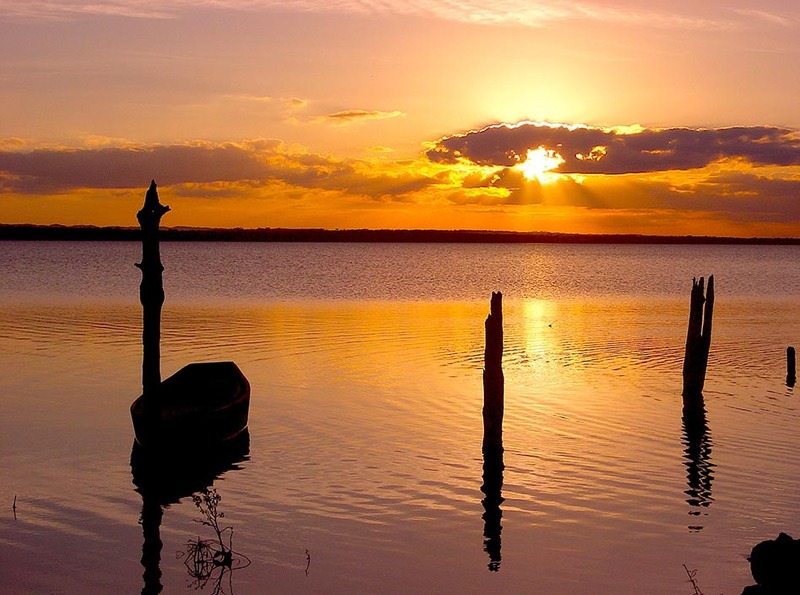 El Ramate is on Lago De Peten (Lake Peten). Just a small village really with young kids playing football on the dusty banks, mothers walking up from the river having done the washing and people generally going about their daily activities. We have dinner overlooking the lake in a small basic restaurant. Standard chicken rice and beans wrapped in tortillas. It is not a bad staple meal and you notice the difference from country to country. Guatemalan tortillas a little more thicker and rubbery than those in Mexico and Belize. A wedding celebration spills out on to the streets with guests celebrating across the village. Adults and children alike setting off fireworks all over the place. We have an early start getting a bus at 5am for our day trip to Tikal. Tikal being one of Guatemala’s and Central America’s biggest tourist drawcard. Or so we found out. We hadn’t really heard of Tikal prior to arrival. Given our hasty retreat from Vancouver our research of must-see sites in Central America has mostly been a day by day affair. We are really just following a take it as it comes approach which is somewhat liberating. 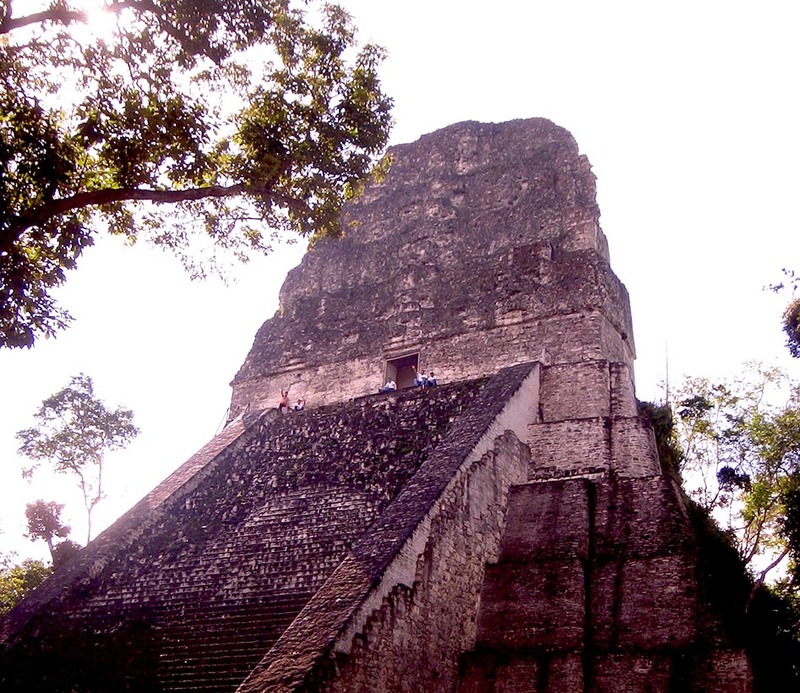 Tikal is set in a deep rainforest. Archaeologists over time cutting the jungle back to uncover the ruins dating back to 700 BC. We arrive at 6am and a low mist is covering the jungle and we take an eerie walk along the vine covered trail as one of the first entrants to this historical site, the sounds of the jungle emanating out from behind the mist. We are headed for Temple IV on the far side of the ruins as it is a recommended sunrise viewing opportunity. Monkeys and Caoties making known that we are on their turf. We eventually scale the heights of Pyramid IV just after sunrise. A pretty spectacular site with the other pyramids peeking above the clouds and through the forest canopy. Most pyramids are accessible to climb either via their designed stone stairs or more modern wooden stairs which have been added in more recent times. We spend the day with howler & spider monkeys swinging above us and toucans singing loudly. It is a hot day and tourist numbers increase progressively in the key areas but the area is big enough to mostly be alone. We end the evening back at El Ramate where the neighbourhood kids have found another reason to let off all their fireworks.